Early rationalism has been an undefined and unstable movement which developed at the beginning of the 20th century. This transition style, just has expressionism, only proliferate because of the invention of new building technologies. Despite its many incostancies, this first step of modern rationalism was the base and the ispiration for the mature International Style. Rationalism, garnered many more supporters than expressionism. The Neue Sachlichkeit (new objectivity), as the rationalist movement was called in Germany, grew out of a desire among painters for an art that directly addressed pressing social and political problems. Architects, in turn, sought to design buildings that might improve the lives of those within them. They called for designs of great clarity that paid strict attention to function and made use of modern materials and technologies. Expressionism drew inspiration from such expressive individualists as Gaudí and was connected with a broader movement in German art, literature, and drama. After the war’s horrible slaughter, which mass-produced weapons had made possible, some German architects grew less enchanted with the machine and sought a design ideal that would express emotion and the essence of life. These architects included Bruno Taut, Hans Poelzig, and Erich Mendelsohn. Purism (1918-1925), was another movement interested in a kind of utopian vision of art and the modern world. Purism was comprised of only two artists: Amédée Ozenfant and Edouard Jeanneret (Le Corbusier). In their own manifesto, Après le Cubisme, published in 1918, they criticized that the heirs of Cubism produced an art that was essentially decorative and ornamental which they believed to be inferior to an approach that would give attention to the basic, essential form of objects. Moreover, they believed that fantasy and individuality had no place in modern art. The machine became the artist's reference, the exemplary symbol of their age. Architectonic form most defines their paintings. Futurist architecture (or Futurism) began as an early-20th century form of architecture characterized by anti-historicism and long horizontal lines suggesting speed, motion and urgency. This artistic movement started in Italy and lasted from 1909 to 1944. It was animated by the poet Filippo Tommaso Marinetti, and works by notable figures such as architect Antonio Sant'Elia and the artists Umberto Boccioni, Giacomo Balla, Fortunato Depero, Enrico Prampolini. Futurist forms suggest speed, dynamism and strong expressivity, in an effort to make architecture belonging to modern times. RUSSIA 1910-1921: During the early part of this period the Russian avant-garde embraced Cubism and Futurism and moved toward a non-objective art (art without subject) exemplified by Kasmir Malevich's development of Suprematism. In 1913-14 Vladimir Tatlin made and exhibited several relief constructions using industrial materials inspired by the Furturist Umberto Boccioni's vision of 'plastic configurations in space' and the 3D collages seen in Picasso's Paris studio. Tatlin used the term Constructivism to describe these works. Within a decade after the fire of 1871, Chicago was a boomtown. By 1890 it had a population of more than a million people and had surpassed Philadelphia to become the second-largest metropolis in the United States.Dankmar Adler's experience as an engineer with the Union army during the Civil War helped him devise a vast raft of timbers, steel beams, and iron I-beams to float the Auditorium Building (1889). In 1894 Adler & Sullivan developed a type of caisson construction for the Chicago Stock Exchange which quickly became routine for tall buildings across the United States. Hendrik Berlage (1856-1934) studied architecture under Gottfried Semper at the Zurich Institute of Technology during the 1870s after which he travelled extensively through Europe. In the 1880s he formed a Partnership in Holland with Theodore Sanders which produced a mixture of practical and utopian projects. A published author, Berlage held memberships in various architectural societies including CIAM. A visit Berlage made to the U.S. in 1911 greatly affected his architecture. He was particularly influenced by the organic, wood-based work of Henry Hobson Richardson, Louis H. Sullivan, and Frank Lloyd Wright. 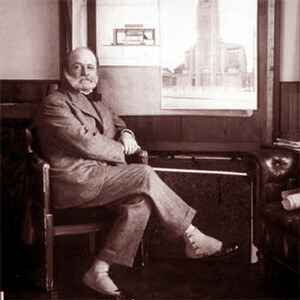 (1874–1954), French architect, one of the most important pioneers of the modern French style. Perret was one of the earliest advocates of reinforced concrete as a building material; his apartment building (1902–3) in the Rue Franklin in Paris was the first French residential building in concrete. Perret was forward-looking in his emphasis on designs that visually reveal a building's structure; his preoccupation with classical proportion links him with earlier architects, as exemplified in his Church of Notre Dame (1923) at Le Raincy. Adolf Loos (1870-1933) set up his own practice in 1897 and produced his first major work - the Café Museum in Vienna - in 1899. From the late 1890s, he began to stir up debate: his arguments against the Viennese Secession style were widely published, while the Goldmann and Salatsch department store (now known as the Loos Haus), which he completed in 1911 opposite the Hofburg in Vienna, caused a furore with its startingly plain facade. Despite the striking simplicity of his exteriors, Loos' interiors were decorated comfortably, using beautiful materials and elegant details. One of his most attractive projects, the Müller Villa in Prague, built in 1930 and restored in 2003, was the culmination of his pioneering 'Raumplan' concept - designing continuous spaces for living rather than regularly divided floors with limited flexibility. Loos rarely designed furniture - he was more prone to adapting tried and tested earlier designs, such as the knieschwimmer armchair he placed in several interiors designed in the 1920s. In 1903, Behrens was named director of the Kunstgewerberschule in Düsseldorf, where he implemented successful refoms. In 1907, Behrens and ten other people (Theodor Fischer, Josef Hoffmann, Joseph Maria Olbrich, Bruno Paul, Richard Riemerschmid, Fritz Schumacher, among others), plus twelve companies, gathered to create the Deutscher Werkbund (DWB). The Werkbund was influenced by the Arts and Crafts movement, though it had more modern purposes. They were willing to create for the industry, change the social structure from a class divided society to an egaletarian mass society and re-humanize economy, society and culture. In 1907, AEG (Allgemeine Elektricitäts-Gessellschaft) hired Behrens as its artistic consultant. He created the entire corporate identity of the company (logotype, product design, publicity, etc.) and for that he is considered the first industrial designer in history. Peter Behrens was never an employee for AEG, and always worked as a freelancer. The Belgian architect and designer Henry van de Velde (1863-1957) had trained as a painter but was so strongly influenced by the English Arts and Crafts movement of the late nineteenth century that he eventually turned his attention to applied arts and interior design. Van de Velde was one of the most important representatives of the Raumkunstbewegung, a movement in architecture and interior design that grew out of the Jugendstil. The Raumkunst [or “space art”] movement concerned itself with a variety of architectural spaces: domestic interiors, sacred architecture, and public buildings. In successful Raumkunst, all aspects of the interior – from construction elements like walls, floors, and ceilings, to lighting fixtures, furniture, and art objects – served the needs of the given space [Raum] with a complete, harmonious, and unified interior being the ultimate goal. In 1900, he left Belgium for Germany, where his career took off. In 1906-07, he was named director of the School of Applied Arts [Kunstgewerbeschule] in Weimar (the predecessor to the Bauhaus) and participated in the Dresden exhibition with the dining room shown here. The German Werkbund was an association of artists, designers, and architects that prefigured the Bauhaus. Unveiled at the Werkbund's 1914 exhibition in Cologne, Bruno Taut’s Glass House was a successful amalgamation of aesthetic, technical, and commercial elements.